There’s been another incident with United this week. This time they created their own overselling problem, let people actually board the plane and get seated, and then told them that four people had to get off the plane because employees needed to fly. Nobody volunteered to give up their seat—even after being offered increasing sums of money—so they had the system pick someone at random. That person was a doctor and he refused to get up, so they called the police and had him forcibly removed. It was ugly. He tried to grab onto the seats to avoid being pulled out by the police, and ended up being knocked unconscious and dragged from the plane with a bloody mouth. I took massive heat on Twitter when I posted this about the incident. CRAZY IDEA: If you refuse to move when a flight attendant tells you to get up, you should expect bad things to happen. It should have been obvious that I didn’t agree with United on this, or with the decision to forcibly remove someone for their own damn mistake. But that evidently wasn’t obvious, and people basically accused me of supporting the United decision, and violence in general. It was strange, but that’s the danger of expressing opinions on sensitive topics in 140 characters. Anyway, here’s my overall analysis of the situation, after thinking about it for part of a day. Airplanes are private property belonging to the airline that owns them. When you’re on private property, the owner can ask you to leave at any time, for any reason. If you don’t leave, they can call the police to remove you. If you then resist the police, in this police-state climate, the odds are very good that you’re going to get hurt. This truth is significantly magnified on airplanes, because of 9/11. That being said, if you’re dumb enough as a private business to call the cops and have someone forcibly removed from your business, for your own mistake, then you should expect the sky to fall on you as a result. You have every right to eject people out of your business, using the over-enthusiastic police, for any reason at all, but we the people have the right to avoid doing business with you ever again because of your stupidity and cruelty. This seems to be precisely what happened. United caused their own problem here due to overbooking as a policy and then letting people get fully seated before ejecting them. That was heroic-level stupidity, and it will justifiably harm their business for a long time to come. But the passenger was arguably just as stupid. When a group of large cops walk up to you, and tell you to get out of your chair—on private property—it doesn’t matter who’s right or who’s wrong at that point. You can sort that out later, with your checkbook or with a lawyer. But while they’re telling you to get up, it’s time to get up. Police are massively over-militarized in this country, and far too eager to use force. You combine that with being on an airplane, and you have a completely predictable situation if you grab the furniture and try to resist them on private property. Nothing about this should be surprising at this point. 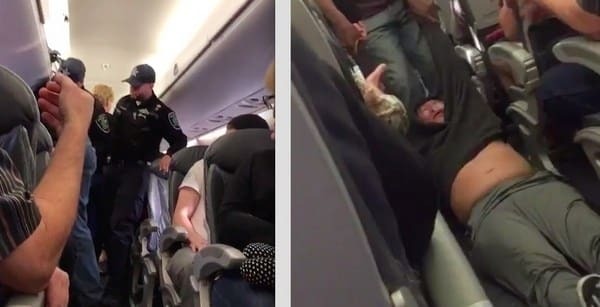 United deserves every bit of the fallout they’re getting, and the doctor should have moved when the police got there—not because of how police should behave, but because of how we know they do behave. There’s a natural tendency when we hear about an incident like this to find exactly one (1) cause for the problem. But sometimes there are many causes, and this is one of those times. United started everything in motion, and the passenger chose to grab the furniture and scream when the cops showed up instead of leaving the plane and taking action afterwards. They both should have known better. Keep in mind I’m not a lawyer, so maybe there’s some subtlety to commercial airplanes that makes them more like public property. But I don’t see it myself. It seems clear to me that the plane is the property of that airline, and that they can make almost any decision they want to about who can fly and who cannot, and then back that decision up with police. That, however, is a double-edged sword, because if they’re dumb enough to call the police to remove someone for THEIR MISTAKE, then they will pay the price in the market, which is precisely what’s happening.